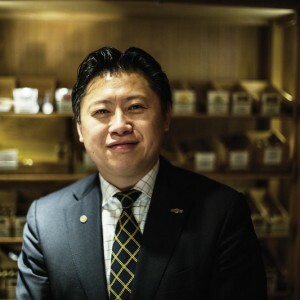 Relighting our Holy Smokes series, Mike Choi breaks down the elementary bits of information that a new cigar smoker should know, beginning with step one – selecting your first cigar. 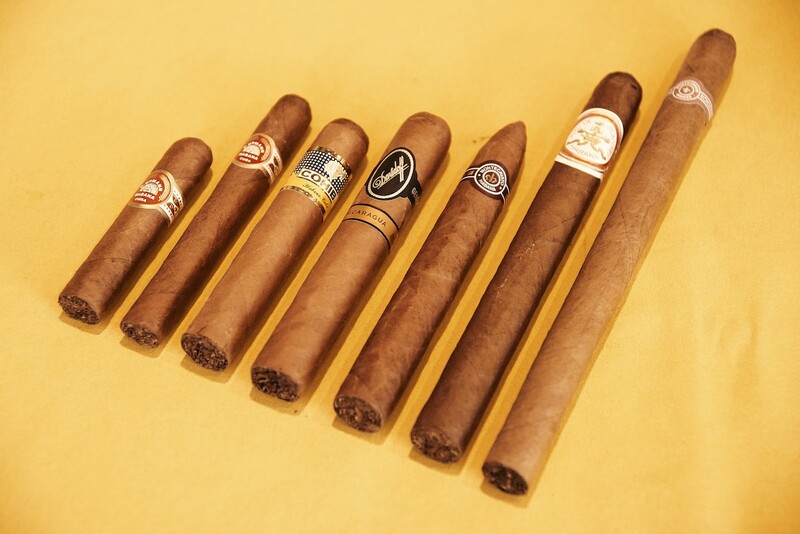 From left to right: H. Upman Half Corona (44 Ring); H. Upman Petit Corona (42 Ring); Cohiba Robustos (50 Ring); Davidoff Nicaragua Toro (54 Ring); Montecristo No. 2 Piramide (52 Ring); Hoyo de Monterrey Double Corona (49 Ring); Montecristo Gran Corona A (47 Ring). There are two easy ways to buy your first cigar; either online or visiting a store or lounge. Now, online shopping has its pros and cons. The biggest pro is convenience, as you can order one at any time and have it delivered to your door. The biggest con is that you don’t get the “shop experience” to choose the type of condition of the cigar or colour of the wrapper, for example. Shops are usually managed and staffed with cigar lovers (my personal rule is that if they don’t smoke cigars, why are they working in a cigar shop?). In the UK, Cuban cigar distributors Hunters & Frankau have established an excellent qualification called the Masters of Havana Cigars. This has been in operation for around six years now and is aimed at those working in the retail/lounge market. With a pass mark of 75%, there are only about 40 Masters in the UK (yours truly being one of them, but H&F no longer lists me as a Master as I have moved into my own vintage and rare cigars business). If you enter a shop and see a member of staff wearing a silver “Master of Havana Cigars” lapel badge, then you are in good hands and should trust their advice. There is nothing like the shop experience for me, as being able to select my cigars based on my own guidelines is so satisfying, the price isn’t everything. Here, we are focusing on the basics of selecting a cigar (the country of origin will be another article). Now, many of you will be saying, “Hold on, isn’t choosing where the cigar comes from the first factor in choosing a cigar?”. To be honest, yes. But, the whole point of this set of articles is to educate a new smoker. Boring you with information on countries may not entice you to try your first cigar. Of course, when you ask about a cigar, Cuba is the first country you tend to think of. However, cigars are also made in Nicaragua, Dominican Republic, Brazil, Mexico, Holland, France, Germany, Indonesia, Philippines and even China, to name a few alternatives. These other countries have produced cigars to fulfill the different tastes in the global cigar market and where Cuba can’t reach. New World producers have developed their own blends and styles which are agreeable to their consumers. In many countries, New World cigar sales have flourished even when Cuban cigars are available. I tend to think about these things: size/shape, ring gauge, length and time. Size - There are a myriad of sizes to choose from. Generally, you’re looking at the gauge and length of the cigar. Common sizes are petit coronas, robustos, toro, piramides and double coronas. Gauge - Ring gauge is the term used to measure the diameter of the cigar. It’s a very outdated measurement and many have gone to describing the ring gauge in the metric system. For now, we’ll stick to the classic method. Ring gauge is measured in 64th’s of an inch. So a 32 ring gauge is 0.5” wide and a 64 ring gauge cigar is 1” wide. If you’re in a shop, ask to hold a few different gauge cigars from a petit corona, robusto, piramides and Churchill, which are four different gauges and lengths. By holding a cigar as if you were smoking, you can quickly decide if the cigar feels comfortable. I prefer slender cigars like lanceros and double coronas. I don’t feel comfortable smoking a Behike 56 or a Wide Churchill. Length - In the normal world, we probably wouldn’t care much about 5 1/8” and 5.5” as the difference is barely discernible to the naked eye. That, however, is the difference between a cigar being called a petit corona and a corona. The longest totally handmade production Cuban cigar is the Gran Corona, measuring a whopping 9.3” x 47 gauge. Time - I’m a great believer in smoking a cigar in one go and not cutting it and smoking later. I rarely choose a cigar I cannot smoke in the time I have, as I just hate to leave a cigar unfinished. Cigars can last anywhere from 10 minutes to over three hours. To begin with, I would recommend a shorter cigar like a petit corona or petit robusto. These are 20-30 minute cigars. Most shops will have a selection of cigars to fit this time period. Many people have started on robustos which last about 45 minutes but again, it depends on the time you have. After you’ve decided on the shape and size of your cigar, you will need to make sure that the cigar is in the right condition and aesthetically pleasing. Again, a well-trained sales assistant will help select a well conditioned cigar for you. Wrapper – This is the leaf that covers the cigar. Typically, you are looking for a smooth, non-veiny wrapper with a consistent colour all over. The wrapper is usually a very thin leaf and is aged the longest. Oiliness is something you may or may not like. Generally, I’ve found that smokers do like a darker and oily wrapper, it makes them feel that it’s going to be a good cigar as it looks good. Colours of wrappers can vary tremendously from candela (green) to oscuro (black). Many brands have a typical shade they like to use but can vary on the range. If you see dark patches, don’t be scared. It’s a sign of over humidity during the drying process, where all the sugar didn’t convert. This can lead to a tasting of “freshness” and a possible dryness in the throat. White spots are called sun spots and are a result of little tears in the cloths that are erected over wrapper fields to protect them. This is an aesthetic issue only. Green spots are another aesthetic issue. The green is not mould, but the chlorophyll not changing colour due to contact with another leaf at that point whilst they were being dried. The next detail to check is damage. Cracked wrappers are not attractive. A good shop will not sell you a damaged cigar. If you have cracked cigars in your own collection, you can probably smoke it. If the cigar’s foot (the end you light) is bulbous, this is a sure sign of over humidity and I’d recommend you don’t smoke it. The final step is condition. If you’re in a shop, let the staff chose it for you. If you’re allowed to choose your own cigar, be respectful as these are fragile and can be damaged easily. Put things back the way you found them too. If you have strong aftershave or hand cream on your hands, or they are dirty, either use some hand sanitiser or ask the shop staff to select for you. There are three points on a cigar which I normally check when selecting: foot, band and head (see above). I personally look for a cigar which isn’t too wet or dry to the touch. A gentle squeeze between thumb and forefinger is all that’s required – excessive pressure can crack nearly all cigars. • Ask questions, don’t be afraid to ask. If you’re a beginner, let them know. They can advise you on brands which are good for beginners and steer you away from choosing strong brands which might put you off smoking cigars. • Let them know your budget. Although I said price isn’t everything, there are cigars which start at under £10 and go up to £5000 each. That could be a very expensive cigar you are sold. • Ask before handling cigars, I always recommend this with shops as they would prefer to help you choose the cigar. If you damage a cigar then you’ll probably be charged for it. 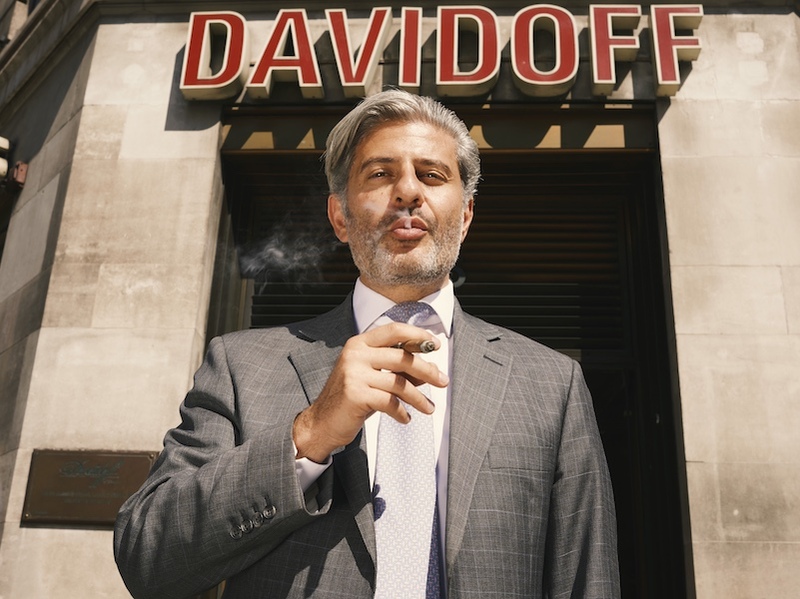 Special thank you to Edward and Eddie Sahakian of Davidoff of London, the finest depository for all your cigar needs. These views are my personal views and you are welcome to yours and I respect that. They come from my experience of both smoking and managing a cigar shop. I have my own vintage cigar company called Casa Puro, I am a Master of Havana Cigars, Runner Up Habanosommelier World Championships, Winner UK Habanosommelier Championship and also won Cigar Journal’s World’s Best Cigar Lounge Award.